Installs on your own computer. Not cloud-based. No monthly fees. CD-ROM or internet access (DSL or Cable recommended). If you prefer a CD installation disk order on CD below. This new ebook is jam-packed with ideas. 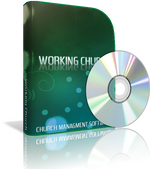 Get your copy free with the purchase of Working Church membership software. Or, click the Subscribe button to get our new church growth email series delivered to your inbox, 100% free! You know you need to be thinking about growing your church. Planning a growth strategy. Preparing for the growth. The additional members. The larger budget. The expanded ministry. But there are so many details and time requirements involved with managing your church every day that you probably don't have the time or the energy to think about church growth. We have pulled together a concise list of 130+ tips and techniques that growing churches are using today. Here's a list that will give you a quick headstart. A jumping off point if you will on multiple fronts. A little something to get your creative juices kicked into gear. From the book: #32 - What do visitors see when they arrive? Try this – pretend you’re a visitor and step inside your church for the first time. What do you see when you first walk in the door? Are the colors warm and inviting? Is everything clean? Do the walls and ceilings need painting? Is it inviting and attractive? What do the decorations, graphics and symbols say about your ministry? 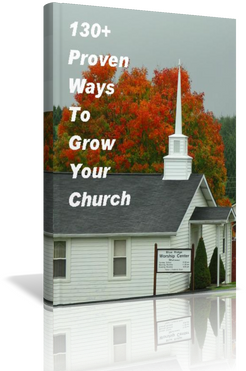 Get your copy of all 130+ growth ideas free with the purchase of Working Church church membership software. Did you know that women primarily make the decision in the household regarding where the family will worship? What are you doing in your marketing efforts to address that fact? And, you do see that you are marketing yourself and your ministry don't you? It's not a bad thing really. It's just a fact of life. We're all in marketing. Every day. Marketing has been given a bad name, but don't think of it that way. You're not in the business of crassly promoting some product that you couldn't care less about. You're marketing the most important thing in the world ... the path to salvation. From the book: Nurseries and Restrooms. Or, click the Subscribe button to get our new church growth email series delivered to your inbox. Absolutely free! Brothers in Christ Software was founded in 2005 by two friends who are indeed, brothers in Christ. With a combined 40+ years of business and accounting software development experience between us, we determined that many churches could dramatically increase the efficiency of their ministries with the help of easy-to-use, affordable, professionally-written church management, church membership and church office accounting software. Church management software is our passion and our lay ministry. God led us to solicit the assistance of a local pastor who shares the same passion to bring business organizational practices to church management by using church software to improve efficiency. Together we have spent countless hours crafting this membership software program. Many more ideas are currently being discussed and developed which promise to continue to improve your church’s efficiency, increase your church membership, church attendance, church growth and more importantly, your effectiveness in fulfilling the Great Commission. Our mission is to devote our time, talent and treasure to assisting those of you on the front lines in fulfilling the Great Commission by standing in the gap between technology and people, and to adapt technology into easy-to-use tools that will allow you to be more effective in all you do. Simply put, we want to partner with you to help build the Kingdom. We’re here because of you and available to you serve in any way we can. We welcome your comments and suggestions for improving our church management software product(s).